Location: Maxi Velingrad Park Hotel & Spa is located right next to a beautiful green grove in th e Ladjene neighborhood in Velingrad. 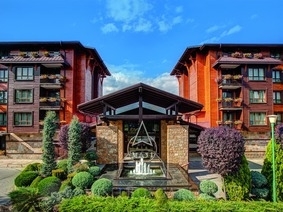 Accommodation: Maxi Velingrad Park Hotel & Spa offers 113 deluxe rooms with a magnificent view to the breathtaking mountain panoramas surrounding the complex. The Deluxe rooms feature their own balconies, area of 52 sq.m, as well as king size bed, area with upholstered furniture, mini-bar, desk, spacious bathroom with shower and bathtub, hairdryer, luxury bathrobes and cotton towels, individually controlled heating and cooling, safe, cable TV, free wireless internet, telephone. - Mediterranean restaurant - with 96 seats and a spacious terrace. - Tavern-winery - with 148 seats and traditional Bulgarian cuisine. - Lobby bar / 24 hours. Spa & wellness: For the ultimate in undulgence, guests can enjoy the wide range of SPA facilities - Finish sauna, Russian sauna, cedar wood sauna, tepidarium, steam bath, hammam, contrast pool, relax room, SPA therapies, fitness center. - 2 outdoor swimming pools - at 36 ° C, each swimming pool has a Jacuzzi with water effects. - Large indoor pool - with a depth of 1.00 m to 1.50 m and a length of 17.50 m, with a separate part for children /temperature of 33 ° С/. The pool is surrounded by numerous relaxation areas as well as an in-house drinks bar. - Salt pool - The water in this pool has a year-round temperature of 36 ° C, enriched with salts from the Dead Sea. - Pool with water effects, waterbeds and hydromassage equipment. Conference rooms: The hotel has 2 halls (200 and 40 seats) with modern equipment – screen, flipchart, high-speed wireless internet, sound equipment, multimedia, individually controlled heating and cooling. - Table tennis and bikes.